For a long time, Christopher Columbus had been thought to be the first European to have reached the New World. However, in 1874 Rasmus B. Anderson published his book “America Not Discovered by Columbus”. It popularized the idea it was Vikings who were the first people from Europe to have arrived in North America. Research by Norwegian-American scholars such as Ludvig Hektoen and Knut Gjerset confirmed this idea. In 1925, U. S. President Calving Coolidge recognized Leif Erikson as the discoverer of America. Five years later, Wisconsin officially adopted Leif Erikson Day as a state holiday. In 1964, President Lyndon B. Johnson created the national observance through his proclamation. Since then, each President has followed suit. 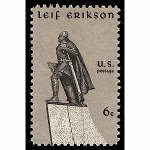 October 9 has no reference to any particular event in the life of Leif Erikson. This date commemorates the anniversary of the arrival of the ship Restauration in New York Harbor in 1825. This ship brought one of the first groups of immigrants from Norway to the United States.